- Enhanced Full HD picture quality with full pixel readout without pixel binning. As the world of 4K continues to grow, you can now capture stunning first person POV 4K footage with the newFDR-X1000VR Action Cam from Sony. Fix Action Cam to your helmet – or any handy spot – and grab vivid, ultra-crisp footage with four times the resolution of Full HD. Whether you’re paragliding or tackling that mountain summit, Action Cam lets you relive and share those experiences with spine tingling accuracy. The rich, vivid colour and clarity of 4K also brings an immersive new dimension to landscapes – you’ll be mesmerised by the sheer detail in every scene. The FDR-X1000VR offers the ability to shoot Full HD[ii] video at 120p and HD[iii] video at 240p, letting everyone emphasise that particularly epic portion of their life story with cinematic slow-mo effects – easily rendered with the free Action Cam Movie Creator software. In an Action Cam first, the FDR-X1000VR can capture high - bitrate recordings at 4K 30p 100[iv]/60Mbps[v] using the XAVC S format which is developed for consumer use based on the XAVC 4K/HD format suited for professional use which was developed for consumer usage based on the professional XAVC 4K/HD format which was developed for consumer usage based on the professional XAVC 4K/HD format. Taking you closer still to true broadcast quality, you can clearly capture complex motion as seen in water spray or large crowds with stunning resolution. Both new models feature a huge 170° field of view, with an ultra-wide angle ZEISS Tessar® lens giving a panoramic perspective as the action unfolds around you. Newly-enhanced advanced SteadyShot[vi] ensures footage is clear and stable – even if you’re careering while hiking or riding a bike. It’s three times more effective than its predecessors[vii] at combatting the effects of rapid vibration – great for aerial shots with Action Cam rigged on a drone. Brand-new Loop Recording on the FDR-X1000VR and HDR-AS200VR makes sure you’ll never miss that unexpected moment. Like many pro-quality broadcast cameras, Action Cam continuously records video into its memory card buffer. 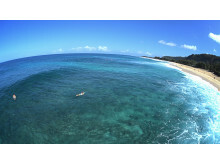 Hit the record button when something happens suddenly – like a freak wave – and the camera’s already captured the start of the scene. Exhilarating pictures are complemented by crystal-clear sound. The high-quality stereo mic on both cameras now features new Wind Noise Reduction. You’ll hear the difference with cleaner audio as you streak downhill on your snowboard or bike. Who wants to fiddle with video editing software when you’re focused on your next adventure? New In-cam Highlight Movie Maker[viii] sifts through your best scenes, assembling a highlights package. It’s quick, it’s automatic – and it only takes a moment to upload the polished results (MP4) to sharing sites like Facebook or YouTube from your smartphone. With the free Action Cam Movie Creator application, you can overlay GPS Data to see your exact route and use the Video Merge function to simply bring together the best of your videos. You can also add favourite music to the edited video[ix] and create your own movie style. The new smartphone application for Android and iOS: Action Cam App[x] makes editing easy. Built-in Wi-Fi connects either camera with the new RM-LVR2 Live-View Remote[xi]. This waterproofed[xii] wrist-mount accessory lets you check shooting angles, start/stop recording, review recorded footage[xiii] and delete any scenes you don’t want. 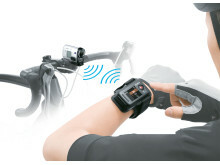 It’s less hassle than fumbling with the camera fixed to your helmet or handlebars – even when you’re wearing gloves. 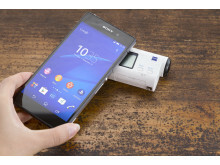 The RM-LVR2 also enables wireless control and monitoring of up to five connected cameras – including other Action Cams[xiv] or Sony’s QX1 and QX30 Lens-style Cameras. Multi Camera Control will be available with PlayMemories Mobile app ver5.2 (released in spring 2015). An extended accessory line-up gives you even more ways to embrace life’s adventures, large or small. 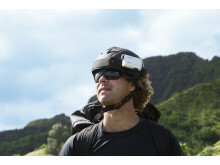 The VCT-HSM1 Helmet Side Mount adjusts easily for perfect shooting angles while you’re surfing or biking. 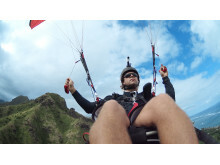 The VCT-BDM1 Board Mount adheres safely and securely, whether you’re into paragliding or kayaking. Exclusively for the FDR-X1000VR, the SPK-X1 Waterproof Case[xv] keeps Action Cam water-tight to depths of 10m. Replacing the camera’s standard case door with the optional AKA-DDX1 Dive Door (for FDR-X1000VR) lets Action Cam focus underwater at depths down to 60m. 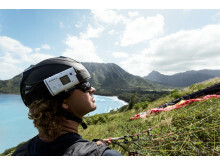 The new Action Cam FDR-X1000VR and HDR-AS200VR video cameras from Sony are available to pre-order now at www.sony.co.uk. The FDR-X1000VR will be available in Europe in April 2015 and the HDR-AS200VR will be available in Europe in March 2015. [xiv] Multi Camera Control is not available with HDR-AS15. HDR-AS30 camera system software should be Ver.3.00 or later. [xvii] Supports Micro USB compatible device. [xviii] Actual performance may vary based on settings, environmental conditions and other factors. Maximum battery capacity will normally decrease with time and use.